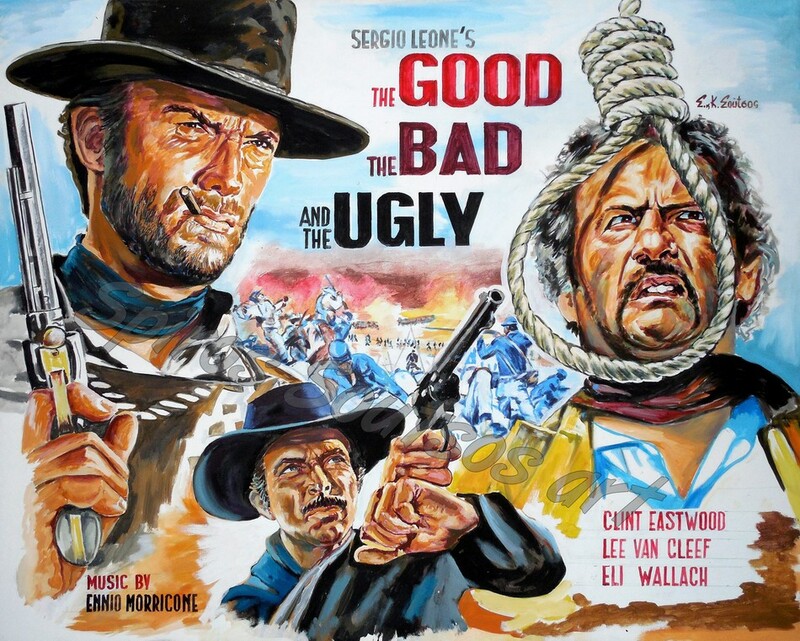 The Good, the Bad and & Ugly (Italian title: Il buono, il brutto, il cattivo, lit. “The Good, the Ugly, the Bad”) is a 1966 Italian epic Spaghetti Western film directed by Sergio Leone, starring Clint Eastwood, Lee Van Cleef, and Eli Wallach in the title roles respectively. The screenplay was written by Age & Scarpelli, Luciano Vincenzoni, and Leone (with additional screenplay material provided by an uncredited Sergio Donati), based on a story by Vincenzoni and Leone. Director of photography Tonino Delli Colli was responsible for the film’s sweeping widescreen cinematography and Ennio Morricone composed the film’s all time classic score, including its main theme. It was a co-production between companies in Italy, Spain, West Germany, and the United States. The film is known for Leone’s use of long shots and close-up cinematography, as well as his distinctive use of violence, tension, and stylistic gunfights. The plot revolves around three gunslingers competing to find fortune in a buried cache of Confederate gold amid the violent chaos of the American Civil War (specifically the New Mexico Campaign in 1862), while participating in many battles and duels along the way.The film was the third collaboration between Leone and Clint Eastwood, and the second with Lee Van Cleef. The director originally wanted Gian Maria Volontè (who played “El Indio” in “For A Few Dollars More” film) for the role of Tuco, but felt that the role required someone with “natural comic talent”. In the end, Leone chose Eli Wallach, based on his role in the western How the West Was Won (1962). Leone also wanted Charles Bronson to play “Angel Eyes”, but he was already committed to playing in Robert Aldrich’s The Dirty Dozen (1967). Leone thought about working with Lee Van Cleef for second time. The Good, the Bad and the Ugly was marketed as the third and final installment in the Dollars Trilogy, following A Fistful of Dollars and For a Few Dollars More. The film was a financial success, grossing over $25 million at the box office. Because of general disapproval of the Spaghetti Western genre at the time, critical reception of the film following its release was mixed, but it gained critical acclaim in later years. The Good, the Bad and the Ugly is now seen as a highly influential example of the Western film genre and one of the greatest films of all time. It is listed in Time‘s “100 Greatest movies of the last century”and Quentin Tarantino has called it “the best-directed film of all time” and “the greatest achievement in the history of cinema.